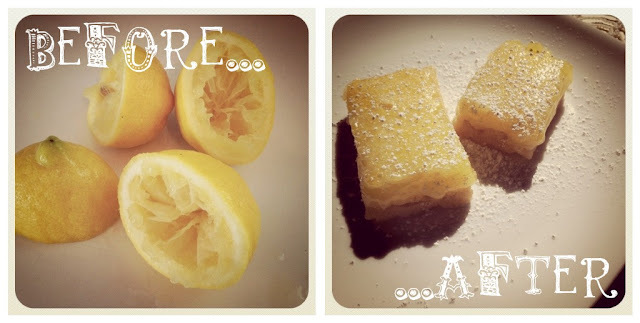 A few weeks ago I posted an amazing Lemon Bar recipe over at Cookie Louise Pleaze in celebration of the lovely, Christina's one year bloggerversary. For those of you who might have missed it, I wanted to share it again because it's just THAT good. Heat oven to 325 degrees. Spray an 8x8 inch baking pan with vegetable cooking spray. Fit a piece of foil across the pan bottom and up 2 of the sides. Make sure the foil overhangs to the pull bars from the pan. Spray again with vegetable cooking spray. Mix flour, salt and confectioner’s sugar in a medium bowl; stir in butter to form dough. Press dough into pan bottom (the bottom of a measuring cup dipped in flour helps press it down evenly). Bake until pale golden, about 20 minutes. While pastry bakes, whisk eggs, sugar, flour, lemon juice and zest in a medium bowl. Remove pan from oven. Add lemon mixture and continue to bake until just set; about 20 minutes longer. Let cool in pan for a few minutes and then using foil handles, pull bars from pan and set on a wire rack. Cool until room temperature. Cut into 1x1 inch squares, dust lightly with more confectioner's sugar and serve. Makes about 36 delicious bars. Enjoy! Hehe I like your before and after pictures! This looks YUMMY. Can't wait to try it! your comment on my lingo post just made my day, btw.